Sharp blades. Handle with care. Keep out of reach of children. Trending at C $7.11eBay determines this price through a machine-learned model of the product's sale prices within the last 90 days. Corrosion resistant stainless steel blades ensure years of use. Soft grip handles make it easy on your hands. Cut Length: 3 3/8"; Scissor Length: 8"; Tip Type: Pointed; Handle Type: Straight. UPC: 051135208335. Trending at C $11.05eBay determines this price through a machine-learned model of the product's sale prices within the last 90 days. 3M-Sctoch Precision Scissors. UPC: 051135208373. Scotch Precision Scissors 8". Master Card. Corrosion resistant stainless steel blades ensure years of use. Soft grip handles make it easy on your hands. 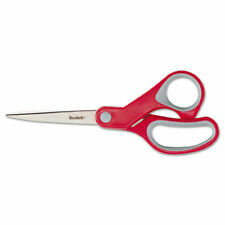 Cut Length: 3 3/8"; Scissor Length: 7"; Tip Type: Pointed; Handle Type: Straight. UPC: 051135208311. ITEM: 3pk Precision Ultra Edge Scissors. Great scissors! Tension adjustble screw. Titanium fused blades resist wear and corrosion. Soft, comfort grip handles. Precision sharpened blades. Individually hand tested. Best Support. Item features. Item Details. Color: Blue, Pink, and Green. Stay sharper longer. Resists Wear and Corrosion. Titanium Fused Blades. Durable brass and stainless steel adjustable pivot. Designed for general-purpose use. Straight handle is designed for both right-handed and left-handed users. From the Manufacturer Available in an array of bright colors, these scissors feature soft, comfort-grip handles for left- or right-handed use. Item model number: 1428. Sharp, hardened stainless steel blades for cutting performance. Cover Material: Stainless Steel. Material Type: Stainless Steel. Soft comfort grip handles for ease of use. Date First Available: June 23, 2008. Precision sharpened blades. CHANGING OR CANCELING YOUR ORDER Smooth cutting action. Finest quality stainless steel blades. CHANGING OR CANCELING YOUR ORDER Great for photos, papers and crafts. Smooth cutting action. High quality durable stainless steel blades. Household use. CHANGING OR CANCELING YOUR ORDER Stainless steel blades. Notions And Miscellaneous. Scotch Multi-Purpose Scissors Pointed 8" Length 3 3/8" Cut Red/Gray 1428 - Sold as 1 Each. Corrosion resistant stainless steel blades ensure years of use. Soft grip handles are easy on your hands. Excluded are Alaska, Hawaii, Puerto Rico, APO/FPO, PO Boxes and International locations. Titanium fused blade, stays sharper longer, 4x harder than stainless steel & greater resistance to corrosion than stainless steel. we will remove the product from your pending invoice. These are titanium-fused blades. High-quality, durable stainless steel blades with smooth cutting action. Soft comfort grip handle is designed for both right and left hand users. Sharp, hardened stainless steel blades for cutting performance. Scotch Multi-Purpose Scissor, 8 Inch gray -& red, right or left hand. SCOTCH 8" scissors with 3" cutter blades.In excellent condition and ready to use. Scotch Precision Scissors - 8" Overall Length - Left/right - Stainless Steel - Red, Gray (MMM1448). 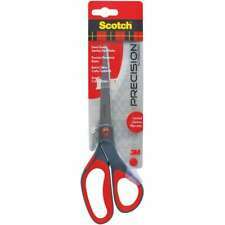 Product Title Scotch™ Precision Scissors, 8" (MMM1448). Precision scissors are a cut above in achieving precision and smooth-cutting action. These are titanium-fused blades. It stays sharper longer, 4x harder than stainless steel, greater resistance to corrosion than stainless steel. It have soft comfort grip handles, added comfort, the colors may vary. Model Number: 1428. Manufacturer Part Number 1428. Product Model 1428. Manufacturer: 3M. Manufacturer 3M. Product Information. Owings Mills, MD 21117. 3M-Sctoch Precision Scissors. Helpful Links. Model: MMM471236. Scotch 8" Precision Scissors, Assorted Colors, 3 ct. Precision Scissors. Assorted colors: blue, green, purple. Handle Color. Blade Style. Professional quality scissors, great for fabrics, heavy weight paper and photos. Handles designed for comfort. Finest quality stainless steel blades for a sharp edge and long cutting life. Sold as an Each. Scotch Multi-purpose Scissors - 8" Overall Length - Straight-left/right - Stainless Steel - Red, Silver (MMM1428). Product Title Scotch Multipurpose Scissors (MMM1428). Ideal for photos, papers and crafts. Scotch Precision 8" Ultra Edge scissors. Titanium-fused blades stay sharper longer. They have greater resistance to corrosion and are 4x harder than stainless steel. Soft comfort grip handles. Individually hand-tested to ensure finest quality and maximum performance. These are titanium-fused blades. It stays sharper longer, 4x harder than stainless steel, greater resistance to corrosion than stainless steel. It have soft comfort grip handles, added comfort, thecolors may vary. Scotch office scissors feature stainless steel blades that resist corrosion. Designed for general-purpose use. Straight handle is designed for both right-handed and left-handed users. Item Details. Stainless steel blades resist corrosion and the durable plastic handle is designed to be both comfortable and functional for right and left handed users. 5-year limited warranty included. Straight handle. 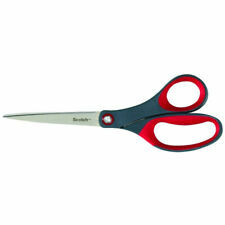 Scotch Multi-Purpose Scissors feature super sharp stainless steel blades for superior cutting performance. 10-year limited warranty included. Scissors with stainless steel blades designed for the safety of all users.